Samsung will launch the India-first M-Series smartphones at 6PM in India and these phones will be exclusively available on Amazon. 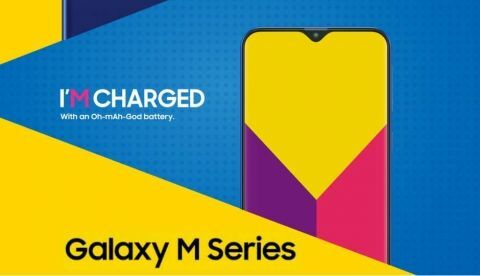 Samsung to launch Galaxy M10 and Galaxy M20 in India today. Both the phones will be Amazon exclusive and will also be available on the company’s e-commerce portal. These phones are expected to debut with Infinity-V displays. In a bid to capture more market share, Samsung will launch it Galaxy M-Series smartphones, the Galaxy M10 and Galaxy M20, in India today. The smartphones are aimed at millenials and will reportedly replace the Galaxy J, On and C series.The Galaxy M series will be sold exclusively via Amazon India and Samsung’s own e-commerce portal. The South Korean company has claimed that these phones will deliver “power-packed” performance. Amazon has already made a microsite for the new M series smartphones with a ‘Notify Me’ button and a similar button is also available on Samsung’s official website. Previous reports and leaks had suggested that Samsung will launch a total of four phones, but it later turned out that today the company will launch only two of the rumoured phones. These phones are expected to give tough competition to phones from Xiaomi, Honor and Realme, which are currently leading the mid-segment smartphone market.The launc of the two handsets will be live streamed on the company's NewsRoom, which you can visit here. The Galaxy M10 is said to fall in the affordable smartphone segment and Digit.in learnt that the phone will be priced at Rs 8,990. It is expected to be offered in two variants, and it’s likely that the lower variant will retail for Rs 8,990. The phone could be offered in 16GB and 32GB storage variants, both with 3GB of RAM. The device has already been seen listed on Geekbench revealing some of its specs. It is likely to be powered by an octa-core Samsung’s Exynos 7870 processor. The Galaxy M10 is likely to sport a 6.5-inch display but it would not be an AMOLED panel. Further, the phone is expected to house a 3,400mAh battery. As per the listing, the dimensions of the Samsung Galaxy M10 are - 155.7 mm x 75.8 mm. The display size is expected to be roughly 6.5 inches and it is expected to sport an Infinity-V type display. It may have a 13MP rear shooter and a 5MP selfie camera. The physical fingerprint sensor is expected to be on the back panel. There are chances that the Samsung Galaxy M20 will be priced Rs 12,990 and is expected to debut with the Infinity-V display. A few days ago, spec sheet and manual of the Galaxy M20 were leaked showing the phone sporiting a 6.3-inch LCD display with a resolution of 2340 x 1080 pixels. Due to the presence of the Infinity-V display, it has an aspect ratio of 19.5: 9 and an estimated pixel density of 409 pixels per inch. The illustrations show that the Galaxy M20 has a headphone jack, USB Type-C port and main antenna at the bottom along with one speaker of the pair on the phone. Citing the manual, the news platform says that there is Dolby Atmos support, which has been seen in Samsung smartphones lately. The SIM drawer is on the left edge, and the volume buttons, power button are on the right edge. In the camera department, the rear camera setup is said to have a 13MP primary sensor with a f/1.9 aperture and 1.12μm pixel size. This is expected to be paired with a secondary 5MP sensor for depth information. Under the hood, the Galaxy M20 may have Exynos 7885 SoC, coupled with by 3GB of RAM and 32GB/64GB of storage. It is seen running Android 8.1 Oreo and may have a 5000 mAh battery. The fingerprint sensor is expected to be at the back.